So how do you _____? Covers random do it yourself topics such as fixing tires!. Building Your Own Super Computer USING Parts Purchased in Part 1/2! Hi everyone, sorry again for being absent Thursday really wanted to finish this post and kept thinking of all my readers depending on my incredibly well thought out instructions to build their super computers!!! But alas! here I am and here is the second addition to: How to Build Your Own Super Computer. CAUTION: Do not shock your computer parts when installing them! When installing these parts into your computer it is imperative that you ground yourself while working. You can buy an anti-static bracelet in case you want to be doubly sure you don’t ruin your hard bought items. So now that we have all computer parts purchased, we can finally start assembling this beast you might call a machine. The first phase involved in assembly are the motherboard, ram and microprocessor components. Unwrap the motherboard and microprocessor. Now, find the microprocessor socket on the mother motherboard and align the marked corner of the chip to the marked corner of the socket on the motherboard, and your done with the microprocessor! Next is the heat sink installation. The heat sink is the medium that prevents your CPU from overheating when in use. Basically it is the unit responsible from transferring the heat your CPU generates as energy into liquid form using a type of coolant and thermal grease to maximize this effect. Evey heat sink is different but they all come with instructions that are usually easy to follow. Lastly, we are going to install RAM. When installing RAM I have always been told to make sure you install each stick starting with the closest slot to the CPU and moving upwards. For this exercise just make sure the stick is correctly installed and you hear it click into place starting with the slot labeled 1. Your RAM slots should be numbered. Now we go to the case! So now we actually have assembled one of the most important parts to your computer. The motherboard/CPU unit! You must feel so proud of yourself, well put the pause button on your congratulatory moment because we aren’t done. Here is what the heatsink mounted above the CPU mounted onto the motherboard looks like. Take the faceplate included with your motherboard purchase and click it into place in the corresponding holes on the case, Next take the spacers and screws also included with your mobo and place them into the corresponding holes on the case. First, place in the spacers, then align the mobo with the faceplate you clicked in a step ago and then screw in the screws through the spacers into the mobo. SIDENOTE: Make sure when installing your mobo you DO NOT screw in the motherboard too tightly butallow it to be “nestled” into the screws. Also ensure that NONE of the mobo cables touch (even lightly) your case it can ruin the whole board. Lastly DO NOT drop the screws on mobo!!! You can damage the wiring of the mobo and ruin it. I understand the PSU is installed inside the case along with the mobo and RAM but it is important enough to me to consider it a separate step (HEART you PSU!). Anyways back to work. So there are two sides to a Power Supply Unit. There is the back (fan side) and the front (wire side). In case you have never seen where a PSU should be located look for a cut square/rectangular cut out area on the top left/right side of the case. Next situate your PSU on its brackets keeping it in place while you screw it in using screws that came with the unit.The fan side should be facing outside the case while the wire side facing inside the case.After installing it correctly, attach the power leads from the PSU to the correct areas on the mobo. There is a big one and a small one. After connecting these leads the rest of the wires should be color coded to match their correct ports. When in doubt look at the manual that undoubtedly came with your PSU. That is it for your PSU we are almost done! Now we are ready to install your HDD (Hard Drive Disk). When you purchased your computer case it also should have come with brackets for your HDD. These brackets should make for a snug fit with your HDD and the screws that also came with the computer case should be used to screw the HDD into these brackets. HDD installation into HDD brackets. After screwing in the HDD into the brackets place the brackets back into its slot inside your case and connect the HDD into your PSU through the correct connector and connect the other HDD cables to the mobo. The red striped cable is “pin 1”. Get the marked “pin 1” side of the red striped cable and find the “pin 1” port on the motherboard and click it in. Your HDD is now correctly installed. We are finally almost done! I’m excited. So now we are going to install your CD-Rom/DVD/Blue Ray drives correctly and make sure they don’t fall apart when you start using them. Locate the faceplate or rectangular slot located on the front of your computer case. Now either connect it to your PSU (any available connector will work) or screw it into place with the face of your drive facing outside within the opening. Then connect the OTHER red striped cable that should have come with your CD-Rom and connect the red stripe marked side of the cable to your mobo. Lastly! connect the audio cable that also came with your mobo and ensure that it securely connects to the indicated audio port on your motherboard and you are DONE! Congratulations! on completing your first working computer! I hope it does work if in the off-chance it does not work please go here. It seemed to be a great thread post regarding issues someone had with a computer they just built so it definitely might help you. Enjoy your AWEsome new computer you tech savvy genius you! Don't forget us when you throw away your used computer parts! Well maybe not SUPER or even Super Computer but depending on how powerful and expensive the components to your computer are you might come very very close. I have been entertaining the idea of building my own computer for quite some time now and I never seem to have the time to research it to find out exactly how to build one so I figured why not make it a How-To Post?! I know it’s an ingenious idea. 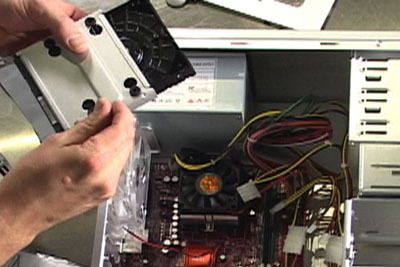 In today (and tomorrow’s) posts I will be discussing how to go out and buy computer parts and then how to put them together to build the computer of your tech geek dreams! The steps themselves come from here. I hope these posts are of some use to you! So I guess the first step with all of this is to determine the purpose of your soon-to-be awesome machine. Later on this will outline exactly which parts your computer is going to need and which parts it might not need. Plus this is probably going to be the easiest step in this whole process (I’m assuming). Cheap Motherboards: These are older motherboard models that are very cheap around the $50 range. Average Motherboards: These are motherboards that aren’t as old as the Cheap category boards but are still cheaper than most newer models ranging from $50 – $100. Additionally, many combo deals are made with CPUs when purchasing this type of motherboard. High-end Motherboards: Here is where I will probably fall when searching for my board. This board I actually might consider buying . But hopefully that gives you an idea of a high end mobo (motherboard). Extreme Motherboards: These mobos are basically all 200+. They usually have their own cooling systems and other extras such as CPU sockets for upgrading or adding another CP. Here are NewEgg examples of “extreme” mobos. Notice the hilarious $14.47 shipping for a $1,099.00 mobo. The real world is so funny sometimes. Size Does Matter. Depending on the intended size of your future computer, different mobos will serve your purpose better. Mobos range in size from normal sized ATX boards to mini or nano ATX boards. Check for FireWire. FireWire is used as a high performance port by your computer to transmit video/digital data from your mobo to your computer. This isn’t necessary unless you are a high end entertainment industry professional. Then it might be necessary! USB Port Central. make sure the motherboard handles enough USB ports to make you happy. Just check the side of the mobo and count the ports. AGP or PCI Express? You will need to decide whether you want a high end video card (like myself) or a lower end AGP card with lower data transfer rates. What type of HDD (Hard Drive Disk) will you use? There are two main types SATA and PATA. The differences between these are basically better airflow within the smaller wires of the SATA and the SATA HDDs are less bulky. CPU pin configuration. Make sure the CPU you purchase (if purchased separately) can fit into the CPU socket of the mobo. Now for everything else! After buying the mobo you are ready to buy all the other components you need for this computer. CPU: The CPU is very important as it is sort of like the “brain” of the computer. The two issues you need to verify with the CPU is if it is the same brand as your mobo and if it fits into your mobo correctly (right amount of pin connectors). The clock speed doesn’t really matter (unless you want a fast clock speed). RAM: Ensure the RAM purchased has the right amt. of pin connectors to click into your mobo and that it fits your mobo requirements for RAM. Some mobos require special RAM some don’t. PSU (Power Supply Unit): I’m currently in the process ordering a Corsair Builder Series CX600 V.2 obviously I’m trying to get the most I can for the cheapest price. If your looking at installing PCIe video cards (1,2) look at getting a PSU that AT LEAST is giving you a 12+V single rail amperage of 25-30 amps. But to be sure check the video card requirements. Find an optical drive for cds/dvds/blu rays. The higher quality they are the better they burn dvds/blu rays. That covers Part 1 of the SUPER Computer Posts! I hope so far it has informed you about many things you might have thought were harder than they looked or learned something new you didn’t previously know about. If your curiosity for computer knowledge has not been sated here is an in depth description of each computer part and what it does! Have a great middle of the week! Weekend is feeling close! Remember! Recycling companies might have better details than your closest Target when buying computer parts! EZPC Recycle does. The Mystery Behind the Google PageRank. I really liked this Google doodle. Click the pic to check out more! Hello and welcome to another How-To post. For this post I will uncover the mysterious convoluted PageRank system Google has put in place in order to properly grade ranked results for a specific keyword(s) and list them accordingly. I say this system is mysterious because Google does not enjoy revealing the intricacies behind the calculations of this complex enigma but the monster company does explain things you can do to predictably influence your websites’ ranking on the organic search results page. First however let’s look at what Mr. Ian Rogers has to say on the PageRank. This gentleman had many interesting guesses as to how one could possibly calculate the PagerRank of their respective website. He takes into consideration other authors’ ideas and obviously incorporates the equation Google showcased once but never again. Please check out his website. Not only do his calculations make sense, he provides many useful links at the bottom of his site such as the first paper on PageRanks published by Google co-founders: Sergey Brin & Lawrence Page. And a neat PageRank Calculator for those of you interested in a machine doing most of the work for you. So here are some points Mr. Rogers makes on pagerank. Ian states Google re-indexes the pagerank of all webpages online every month AND changes the pagerank scale as well making it difficult to accurately gauge the exact pagerank number your webpage currently has, therefore any PR (pagerank) numbers you receive from toolbars or PR checkers are essentially really good guesses not necessarily definitive PR’s. Mr. Rogers makes a very simple definition for pagerank he states: “In short PageRank is a “vote”, by all the other pages on the Web, about how important a page is. A link to a page counts as a vote of support. If there’s no link there’s no support (but it’s only an abstention from voting rather than a vote against the page). ” I really like this definition. It is very simple to remember. Another problem in calculating PR of websites is that in order to use the algorithm provided by Google in the original PageRank paper developed by Google founders (Sergey Brin & Lawrence Page), you need to know the PR of the pages linking into your webpage. Then you can’t find out those PRs until you find the PRs of the websites linking to THEM and so on. However that same paper also provides us with the algorithm necessary to duplicate the normalized link matrix of the web and therefore allows us to check our PR without knowing anyone else’s PR! PR(A)= (1-d) +d (PR(B)/1), PR(B)=(1-d) +d (PR(A)/1), d=0.85. So this is the equation (according to Mr. Roger) one can use continuously to more accurately find the PageRank of his/her respective site. In other words, Page A(PR(A)) links to Page B(PR(B)) and vice-versa and d shows the damping factor for the answer you get. Therefore, assume your webpage is Page A and an inbound link to your site is Page B. Then just plug all the numbers repeating the process using the answer for PR(B) as the PR(B) value in the 2nd run through. Ian later explains how the arrangement and order of each calculation matters when calculating PageRank. This makes sense because PageRank depends on the quality of inbound links on your site which are essentially “voting” for your page and their respective PageRanks as well. When trying the equation keep in mind the base value for the average PageRank is 1. With the above equation any page that is online will start off with .15 of a PR or “voting power however, Mr. Roger warns Google supposedly has a post-spidering phase back at their lair which automatically deletes any pages without inbound links! Scary…. Mr. Rogers then illustrates how external sites that your site links to do not help raise your PageRank up by much if they themselves are not inbound links on YOUR website. The value for the owner homepage went from: PR(A)= .92 to: PR(A)= 3.35! That is quite an impressive increase. Mr. Rogers goes on to give various examples of really interesting ways to structure your website in order to manually focus traffic to the main homepage, or whichever page you want to focus on for that matter. He also explains a couple strategies one can use to greatly improve their PageRank. Tip #1: Be a Mega-Site. Sites such as Fox News, which has a PR of 8 by the way, have such large amounts of articles contributed by many authors on a weekly basis and so many inbound links from these pages going back to their homepages they conquer the rankings because of the amount of quality content they have at their disposal. Tip #2: Give Away Something Useful. phpBB was a company that developed a bulletin board system they gave out for free to any interested websites over the internet and basically became so popular it raised their PageRank to an 8/10! (Currently it’s at a 5/10 but that just shows nothing lasts forever!). Tip #3: Stick with One Page When Raising the PR. Essentially the co-founders of Google stated in their paper that the average PageRank (at the time) is 1.00. Therefore instead of fighting a battle of averages for every page focus on raising the rank of one page in particular (homepage, request quote page etc.). This will concentrate your efforts on one page maximizing their effects and bringing up your site first in the rankings more quickly! I hope this post was informative as it was interesting (at least to me!). Again these calculations are not certified by Google. But they do give very interesting glimpses into how this ranking system seems to operate. Google does state the equation is ever changing and the equation most people use to figure all this out might not even be used anymore. But interesting to know nonetheless! Make the world a better place. Recycle with us today! How Do I? : Changing a Tire….by Using the Force. So I was thinking of different ideas for posts today and a small light bulb (very small light bulb, like microscopic) suddenly appeared above my head turned on and then short circuited and cracked the side of the bulb. Most likely because of my cerebral potential XD. Anywho, it came to me that it might help some of my readers that are just “2 cool 4 school” to elaborate on changing a tire. I know it sounds somewhat mundane but to be honest I’ve never replaced any of my tires let alone cared to figure it out. So hopefully with this post I will help enlighten us to be a little more self reliant. Let’s get greasy. Yes, Yoda is using the Force to change a tire. Duh. step ONE: So before we can switch the tires we need to make sure nobody will run you over. Therefore, now would be the best time to situate yourself in a stable work environment such as the side of the road, preferably far enough away from oncoming traffic and somewhere flat and solid. step TRES: Now we are getting into the duurty details! Take out your spare tire and jack. Place the tire jack under the *metal portion of the frame of your car in *front of the tire you wish to change. If your car has molded plastic on the bottom you can crack it by misplacing the tire jack, so use the force or your car’s owner’s manual. step VIER: After getting the tire jack in place we are going to pump the jack until it *supports the car. Make sure it does not lift the car but supports it and also that the jack is completely vertical. step SIX (The French six, not the English one): Now we are going to take off the hubcap of your flat tire in order to remove it. First you will need to turn the take the hubcap off. Next turn the nuts counter clockwise in order to loosen them from the tire and eventually remove them completely after they are all loose (The tire needs to be off the ground, f.y.i.). Oh and make sure you use a wrench to loosen the nuts, your hands probably won’t work. Your car should have a wrench stored somewhere check your owner’s manual or just keep a cross wrench handy in your glove compartment. step SETE: Remove the tire. This is the easy part. For added protection against your car place the old tire directly under the frame next to the jack in case something goes horribly wrong and the jack pops out of place. step HACHI (eight in Japanese): Now you can firmly place the new tire onto the axle by aligning the wheel bolts with the holes in the rim. After the tire is in place replace the lug nuts you removed earlier by using more of your muscle…and the wrench. step NI: Lower the car back to the ground but not all the way. This is because you need to continue tightening the lug nuts the tightest you possibly can. step TIEN: Finally we are almost done! I feel more accomplished already. Now you will lower the tire jack all the way and take it out from under your car. Then triple check your nuts (lug nuts that is!) and make sure they are securely fastened.Lastly rpelace the hubcap firmly onto your wheel. FINAL step: Well I hope you have enjoyed this interesting take on a typical step by step guide on how to change a tire. To wrap up this tutorial, make sure you get rid of your old tire by throwing it away *properly (i.e. give it to a recycling center) or get it repaired by a mechanic for around 10 dollars (USD).